Baby Vanellope Hope was supposed to be born on Christmas Eve. But an incredibly rare condition which had her heart growing on the outside of her body meant she needed to be brought into the world early. On Wednesday 22 November 2017 a team of around 50 clinical staff at the world famous Glenfield Hospital, worked together to bring her into the world safely and give her a fighting start in life. Naomi Findlay and Dean Wilkins from Bulwell, Nottingham found out they were expecting their first child together in June 2017, but a scan at nine weeks brought them some scary news that they were not expecting. 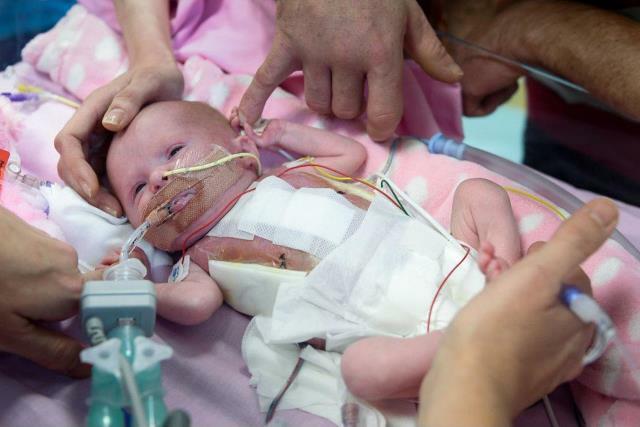 Scans showed that their baby’s heart had begun to grow on the outside of her body. This incredibly rare condition - Ectopia cordis – was confirmed at another scan carried out by Glenfield’s foetal cardiology consultant Frances Bu’Lock. Staff at Glenfield hospital supported Naomi and Dean’s decision to keep their baby and made plans to deliver her on Wednesday 22 November baby Vanellope Hope Wilkins made her way into the world with the help of around 50 staff made up of doctors, midwives, nurses and allied health professionals, who all played a part in delivering baby and keeping her and mum safe. Vanellope had her first surgery just 50 minutes after her birth Vanellope was stable enough to be transferred back to the main theatre where she had been born to the waiting anaesthetists, congenital heart disease and paediatric surgical teams who began the task of putting her entire heart back inside her chest. Since her first surgery, Vanellope has had a further two surgeries as her heart naturally sank into the chest and her skin was sealed to protect it. She will require further surgeries in time, but at the moment the staff and family take each day as it comes and help this little miracle get strong enough to go home.